We were there with the charity we are partnered with this year Oxford Association for the Blind not just raising money for them but raising awareness of the brilliant things they do to help the community. You can find out more at www.oxeyes.org.uk. The Carnival was a buzz of colour and sound we met the Stiltwalker from the Oxford Brookes University stand and there were stalls cooking food from around the globe which looked delicious including one stand selling whole coconuts with a straw in them as a drink. The Carnival is well worth a visit. 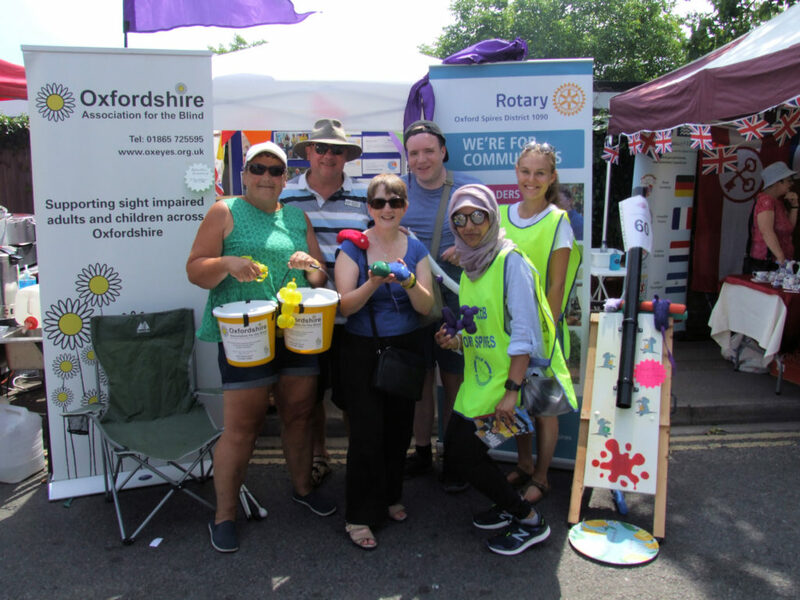 A big thank you to Oxford Rotaract who helped us out with volunteers on the day (big thanks to Nina and Saheela) and to the members of Oxford Spires who also braved the heat and introduced Oxford Association for the Blind to Cowley Road Carnival. Working together we raised £101 for the charity. It really was an inspiring day.